They say absence makes the heart grow fonder. But that adage, such a truism when applied to interpersonal relationships, doesn't quite carry the same weight when extended to the intimacy between expectant geek and promised hardware. So here we are, six months later: CES has long passed, the One X and Galaxy S III have been revealed, and the Android landscape is now decidedly governed by Ice Cream Sandwich. 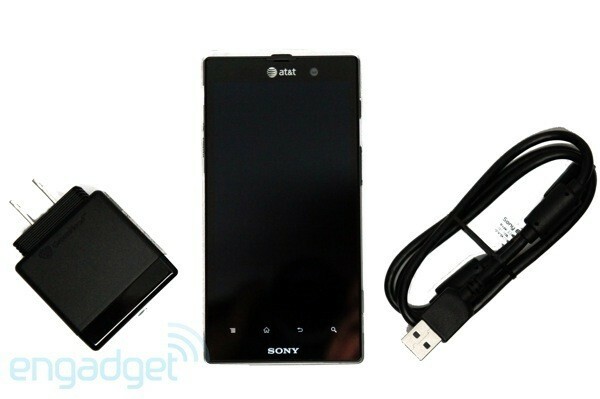 A veritable eternity has passed since Sony first introduced the AT&T-bound Xperia Ion, its LTE flagship for the US market, muting much of the initial buzz surrounding the handset. So, why choose now to bow a smartphone that's already been outshone by more recent and robust contenders? Perhaps it's simply a case of better late than never. But surely after all of that time, both parties could've managed to ship it with Android 4.0 and not the dated 2.3.7 build of Gingerbread that we get instead. The Ion's aging OS and 1.5GHz dual-core Snapdragon S3 CPU may be a nod to mobile's past, but the rest of its internals paint a more forward-thinking picture. This 4.6-inch Sony-bred device boasts a 1280 x 720 HD Reality display, 720p webcam / 12-megapixel rear camera with Exmor R sensor, PlayStation Certification, 16GB of storage plus 1GB RAM, a 1,900mAh battery and NFC. For that spec mix, you'd expect the Ion's on contract cost to double up on the Benjamins, but instead it's been priced to sell at an attractive $99 -- much like the Lumia 900. Will that retail positioning hurt or help its prospects? Can the Ion effectively straddle two worlds, carving out an identity for itself and attracting a defined market segment? Or will this hodgepodge of internals prove too inconsistent for any demographic, save, perhaps, bargain hunters? Find the answers to those questions and more below. 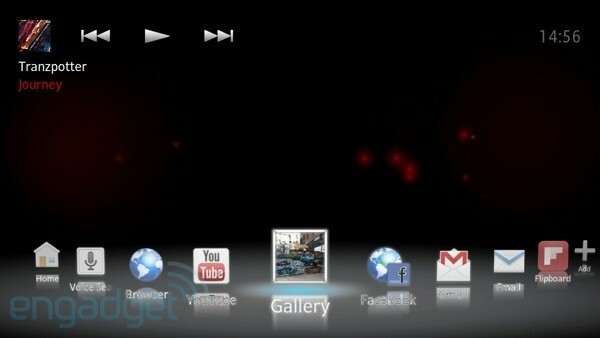 Sony's Xperia Ion is a dependable device that heavily plays up HD, but falters with a mix of old and new specs. 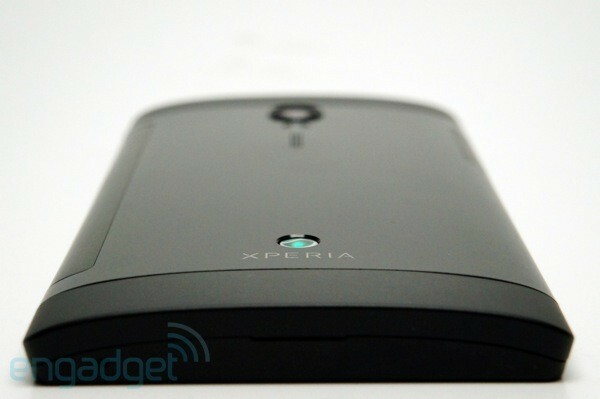 How would you rate the Xperia ion? On the surface, this daring Japanese-made smartphone darling cuts a dangerous figure, assuming a dual identity reinforced by the rigidity of its '80s-esque, hard-lined facial perimeter and the seductive curve of its aluminum back that all but screams contemporary industrial design. This juxtaposition of old aesthetic values married with the new, sharp edges with soft, and abrasion with comfort should tip you off to the personality disorder belying this 4G LTE handset. Let's take it from the top then and work our way down. 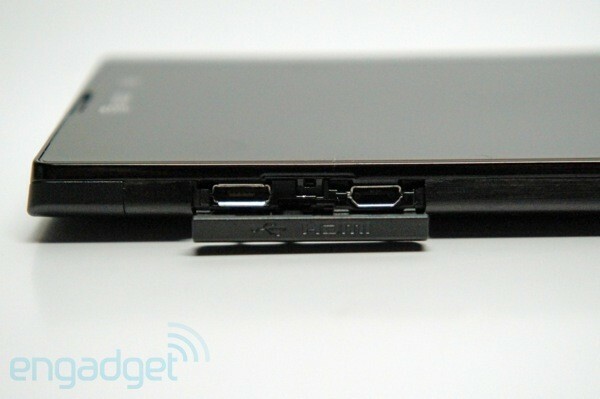 This is, undeniably, Sony Mobile's US smartphone flagship. 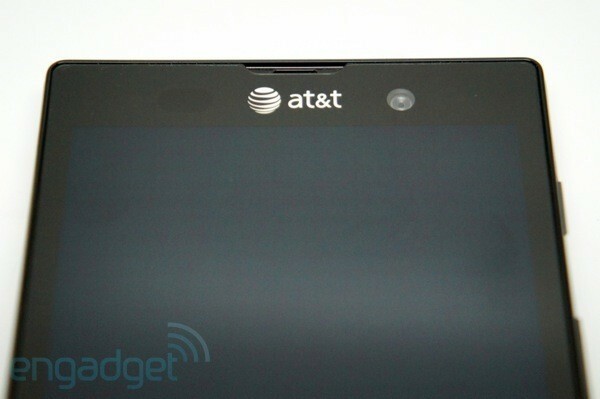 So, we have to wonder why that megalith of the electronics industry allowed AT&T to overpower its own logo and tramp stamp the top of the Ion's front face in such a domineering manner. A passing glance at the handset might lead a passerby to believe the phone was white-labeled for the carrier's lineup -- hardly the first impression any company looking to make a big splash would want to evoke. While we're confident the phone's build will either strike chords of praise or discontent from curious consumers, it somehow seems marred by the presence of any brand marking on its surface. Even the usual array of Android capacitive buttons, each underscored by mostly dormant slivers of white light, and the notification light on the upper right manage to interrupt the unbroken black onyx lake this front face could've been. If only both parties had found a way to plant their corporate flags across its back, the Ion would assume a greater level of visual majesty, akin to the minimally branded Galaxy Nexus. Which brings us to another point: this phone's lack of the NXT line's distinctive transparent element. We pressed the company for answers as to why that necessary flair went out the window and, as you might've presumed, the blame for its omission lies squarely with AT&T. It appears the operator opted to maximize screen real estate while still keeping to the most compact size possible all in the name of customer convenience. You may feign your appreciation here. That quibble aside, don't expect this clash of aesthetic ideals to merge into any sort of ergonomic ideal. You'll find that holding the handset for any lengthy period of time, despite the smooth contour of its brushed aluminum back, will gradually become bothersome. Had Sony's designers rounded the screen's edges, this roughness could've been averted. Instead, it digs into the cushion of your palm precisely where it shouldn't. It's also no featherweight at 4.9 ounces (138.9 grams), placing the device somewhere between lighter Android titans like the plasticky Galaxy S III and porkers like the Lumia 900. Said differently, its weight is about on par with the iPhone 4S, which makes sense, given the inclusion of premium materials. At least that heft should keep the non-textured back from slipping out of your hand. With its 4.6-inch display, the Ion matches up in size to other large-screen handsets, measuring 5.24 x 2.7 x 0.46 inches (133.1 x 68.6 x 11.7mm). As you'll notice, the Ion doesn't cut the thinnest of figures and, in a way, we wish it would. This severe-looking slab could've benefitted from a sleeker silhouette, giving it a sharper RAZR-like essence. 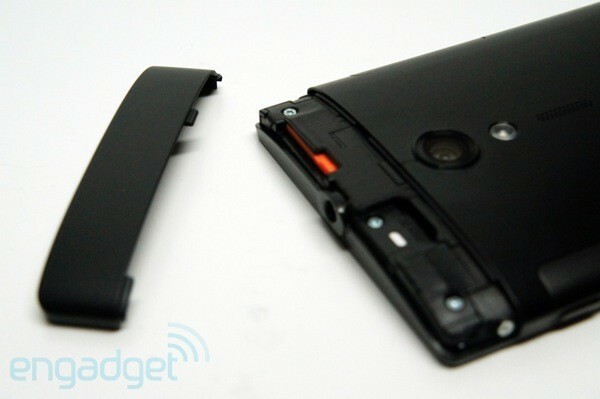 On its back, two strips of soft-touch plastic break the back into segments: a removable bit up top that houses the 3.5mm headphone jack, a micro-SIM, a vacant microSD slot (the phone comes with 16GB of internal storage) and a fixed piece at the bottom, above which you'll find the Xperia logo. Move further up and you'll encounter the 12-megapixel camera, flash and nearly invisible speaker grill. The only other noticeable breaks from the flush metal housing are a curious division surrounding the side-mounted dedicated hardware keys (power, volume rocker and camera button) and a flimsy flap on the opposite edge that hides ports for micro-HDMI and micro-USB. There's also NFC inside, but rather than use it for mobile wallet payment services, Sony's promoting its programmable Smart Tags -- accessories similar to Samsung's TecTiles. The scratch-resistant mineral coating (read: not Gorilla Glass) laid atop the display does a fine job protecting the glass from in-pocket abrasions -- not that we Engadget staffers are in the habit of abusing precious mobile kit. What's more, the touchscreen is also fairly immune to unsightly fingerprint smears. And, according to the company's reps, the RGB LCD panel that lies beneath makes the 1280 x 720 HD Reality display much easier to discern in bright sunlight. Does that claim hold any water? To be frank, it's not that much more of an improvement over your standard mobile fare; certainly not enough to merit a bullet point. Sony's understandably proud of the Ion's 720p panel -- so much so that it's hung the phone's entire existence on its performance as an "HD Everywhere" hub. That is to say, this device was crafted to be an ambassador for Sony's Entertainment Network, made to push high-resolution content to HDTVs. And the company's confidence is well-merited, too. The display, powered by a mobile version of Sony's BRAVIA Engine, delivers a crisp level of detail that's complemented by a vibrancy of tonal colors. Tilt it slightly in any direction, however, and suddenly the warm color saturation dies out slightly, dropping down to something a little duller and less contrasty. Could you log an hour or less watching movies or TV shows on this handset? In a pinch, sure, maybe while taking a short hopper flight. But that's not how Sony wants you to do it. To really maximize the multimedia focus on the Ion, you'll need a micro-HDMI to HDMI cable, a compatible television and a library of content the company's only too happy to furnish via its Video and Music Unlimited networks. Once connected to a device or peripheral, the Ion's LiveWare Manager feature pops up, allowing the user to set actions (e.g., launch the Music Player when headphones are plugged in) that will be triggered for all subsequent connections. This make life easier, with that HD-out feature a no-brainer to access, Sony's created a TV launcher that springs to life when connected to HDMI and is navigable via mapped function buttons on your remote control or the phone's own display. It's an incredibly fluid and intuitive experience that doesn't require any know-how, and could be executed flawlessly by even the most severe Luddite. As you can see in our screenshot, you select content from a customizable carousel at the bottom of the screen. That menu is populated with pre-selected apps and also those of your own choosing. 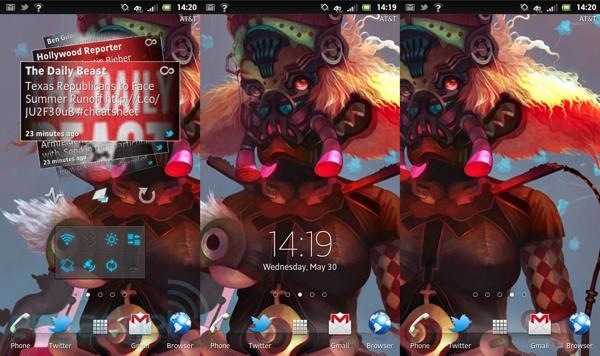 Up top, meanwhile, you'll notice a music widget which directs you to your stash of audio files. Overall, it's hard not to be impressed by this feature. You can tell Sony put time into refining this experience, essentially fool-proofing it for a wide swath of potential users. But as fantastic as this HDMI mirroring is, it still requires the use of a cable, and that's something your average Joe consumer is not likely to possess or rush out to purchase. And here, we're once again presented with the phone's existential crisis: to whom does it belong? In the hands of a true geek, the Ion has the potential to see its feature set put to full use, but that close-knit niche isn't likely to be eyeing a mid-2012 Gingerbread handset with an outdated processor. Pitch it to a less savvy segment and the Ion is bound to simply become a smartphone as currently defined -- great for messaging, photos and social networking. Sony could overcome this hurdle by conveniently including that requisite HDMI-out cable in the box, but as it stands, you'll only get the standard micro-USB cable and charger dongle. Android 2.3.7 isn't the OS prospective fangeeks with credit cards at the ready -- nor we presume, Sony, with this much-anticipated debut -- wanted for the Ion. And despite attestations that the phone will absolutely, positively be privy to an ICS upgrade, that promise seems more wispy talking point than concrete rollout reality. Do you want a Gingerbread handset in June 2012? If you know any better, you won't. Need we remind you that Android 4.1 is on its way? Again, this is an area of contention that sub-$100 pricing could smooth over; a bet we're sure the company's itching to see play out in its favor. It would be a waste of digital ink to recap the features of Google's almost-thrice-removed mobile operating system. It's functional, but passé -- a footnote in the march towards Jelly Bean. We will, however, give credit where credit is due to Sony for placing lightly sprucing up the aging Gingerbread with a prettier and more visually uniform skin. The app drawer here zips up from below and floats above your chosen wallpaper, showcasing the host of pre-loaded applications arranged in transparent cards that shift left and right. It's not quite Timescape (or the company's execs wouldn't have us call it that, anyway) and going forward it appears Sony plans to sidestep skins in favor of an unobstructed upgrade path. So, that's definitely a bonus for consumers on the lookout for the latest and greatest. To further placate customers that opt-in for the handset, as well as to make up for the glaring lack of Android 4.0, elements of that more advanced system have been incorporated into the Ion: a screenshot shortcut (visible on the power menu) and audio controls on its lockscreen (accessible by swiping the time display to the left). There's at least one area where Sony has kept its finger on the consumer's pulse, and it's most apparent when you tally up the Ion's dearth of truly offensive bloatware. In fact, the main offender here is AT&T, given that half of the 14 pre-installed apps belong to the carrier. But there is salvation for your 16GB of internal storage: you can uninstall nearly all of these unwelcome intrusions (save for Facebook which benefits from a special Xperia integration). And speaking of managing your allotted 16GB of space, Sony's made it so that internal storage is relegated to MTP, whereas any SD card you bring to the table will be handled by MSC. We can't fault the Ion for shipping with a dual-core setup; the currently in-vogue, quad-core chipsets bolstering international versions of flagships like the One X and GS III still haven't found a way to play nicely with our homegrown LTE networks. Yet, where those aforementioned handsets get to pack the power punch of a Snapdragon S4 stateside, the Ion has to make do with an S3. Based on that spec difference alone, you may feel inclined to wash your hands of this Xperia, but you'd be ill-advised to write it off so quickly. Thanks to the unobtrusive UX and a hearty amount of optimization on the part of Sony's engineers, the Ion unmistakably flies. Only once did we ever encounter a hesitation in all of our uninterrupted navigation through the five homescreens and app drawer, and that only occurred when we attempted to access Sony's own finicky Timescape widget. That trifling hiccup aside, we have no real complaints with the actual performance. It's dependable and appreciably fast. Outdated OS be damned, this smartphone works and, in the end, isn't that what we're all after? The Ion is a curious case. It's an outlier to every category it flirts membership with, so to really give you a sense of how it stacks up, we selected rival handsets running the same dual-core 1.5GHz Qualcomm MSM8660 Snapdragon S3 processor: the Spectrum on Verizon and Galaxy Note on AT&T. Of the three, only LG's device currently sports sub-$100 pricing, putting it on equal market footing as the Ion, although now it's also considerably older and consequently discounted. A shared processor, however, is not a recipe for standard benchmark results. Au contraire, the Ion resoundingly comes out on top, save for a minor AnTuTu loss, but those wins are marginal at best -- SunSpider and Quadrant showcase its clear edge. Across the board, though, this trio of enemigos is at a relative standstill and we're sure further testing could even deliver flip-flopped results. The handset's 1,900mAh battery offers some generous capacity for a smartphone that's not attempting to support a phablet-sized display or a more cutting-edge, multi-core chipset. Clearly, Sony wanted the Ion to compete with superior runtime. So, how does that juicepack translate into real-world usage? In keeping with this review's theme, the result are split. Under the duress of our formal rundown test, the Ion lasted just shy of six hours -- a far from impressive endurance. In actual day-to-day moderate use, however, that figure tripled, rising up to about 19 hours -- that's with WiFi, NFC and GPS enabled, Twitter syncing every 15 minutes, one push email account active and brightness set to medium. Which to believe? We'd caution you to turn a blind eye to standardized testing and err on the side of everyday performance. 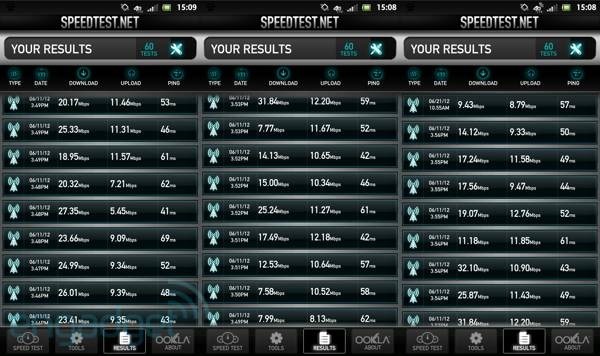 Back when AT&T first launched LTE, performance (if you were lucky enough to have coverage) was phenomenal. That high bar held up for quite some time after, but nowadays the jaw-dropping briskness seems to be bogged down by increasing network demands (read: user adoption). So, it took a bit of adjustment at first to comprehend the less-than-blazing numbers we were logging around New York City. In areas where we'd become accustomed to downlink speeds in the 20Mbps to 30Mbps range, we were now barely hitting 10Mbps and up. That's not to say pockets don't exist where those next-gen radio waves notch numbers in the mid-30s -- they do, but it's becoming more of a rarefied occurrence similar to Verizon's current 4G LTE real-world performance. Uplink speeds were much more consistent, mostly hovering in the low teens and only occasionally dipping down to HSPA levels. It seems like an afterthought to mention a smartphone's actual voice merits, but if you do count yourself amongst those spare few that like to reach out and touch someone, you're not in for the most premium of experiences. Incoming call quality was decent, if somewhat compressed sounding and our own voice apparently came across as slightly muffled and condensed. We also noted a few instances where our conversation dropped, owing to poor signal strength. Remember that HD Everywhere mantra Sony's been pushing with the Ion? Yeah, well that focus finds a logical home in the phone's imaging capabilities. On the optics front, the handset's outfitted with a 720p front-facer and 1080p-capable 12-megapixel rear module with Exmor R sensor. Then there's the dedicated, dual-detent hardware key that can be configured to wake the device from sleep to fast capture in just over one second. Delve into the settings and you can either disable this handy function or set it to launch the camera app only. The same goes for capture settings, which can be configured to trigger the shutter by touching the display, selecting the onscreen software key or actually depressing the side-mounted key. Images that take advantage of the shooter's full resolution will be constrained to 4:3, leaving 16:9 shots for the 9-megapixel setting. The camera app's UI can also be customized to suit a user's taste by simply long-pressing and dragging the desired submenu icon to the interface. Scene modes are just as diverse as we've seen on other cameraphones and setting that to Normal will give a user the ability to toy with exposure settings as well. For most, though, leaving the Ion in default Auto should suffice, as we found the camera to, more often than not, settle on the appropriate mode for a particular shot. Ironically, as highly touted as that Exmor R sensor is, it was only in low light that we encountered difficulties getting a clearly focused image. Otherwise, as you'll notice from the gallery below, images deliver crisp levels of detail and an overall balance of natural color, appearing neither oversaturated nor dull. Video on the handset was rather disappointing. Chalk it up to a lack of image stabilization, but our recorded sample is anything but still and, as such, the surrounding imagery never quite settles into clear focus. Audio, however, is superb even in the midst of busy downtown New York City traffic. What's the verdict? Well, if you've been following along you already know that the Ion has two irreconcilable faces -- and one tempting price tag. Were we smartphone doctors, a prescription for an imminent Ice Cream Sandwich upgrade, an aluminum body-lite diet and maybe even some dermabrasion for that mucked-up, logo-bedecked front face would be in order. Also, we'd suggest counseling sessions for the bevy of conflicted Sony engineers that seemingly tossed the Ion back and forth, shuffling it between personas, cramming it full of counterintuitive specs and taking their sweet time (six months!) to do so. Of course, a heaping of that muddled design input came from AT&T, so we'd also set aside time for couple's therapy. Does inner turmoil make this Xperia a terrible choice for users desperately seeking LTE on a budget? By no means. But, this phone's potential is only partially untapped -- a problem that will eventually be remedied by an upgrade to ICS. The Ion could've been a serious contender had Sony not compromised on certain features. 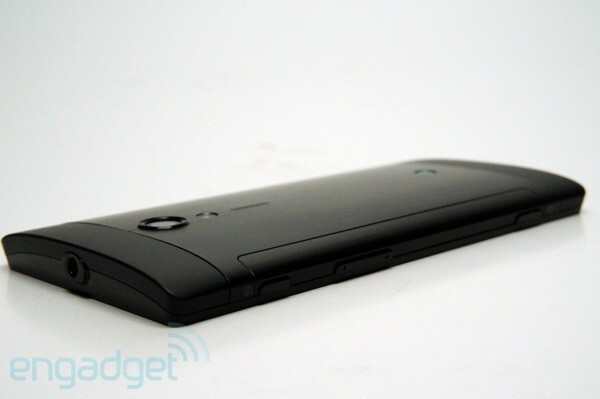 This wants to be a heavyweight by the looks of its 720p display, HD mirroring, 12-megapixel camera and NFC inclusion. Instead, what it winds up doing in its quest to placate both geek tastes and Joe Blow sensibilities is carve out a lonely island for itself.